Though I don’t have colored hair at the moment, I’ve found that switching to SLS-free shampoos has made my hair and scalp healthier. Sodium lauryl sulfate (SLS) and sodium laureth sulfate (SLES) are fairly common in bath products because they produce that thick lather we usually associate with effective cleaning, but it’s actually really harsh on the skin! It removes too much of the natural oils that keep your skin at a healthy moisture level and, in my case, makes my skin super dry and itchy. For some people, it can even trigger pimples on the scalp, forehead, and even on the back (aka, bacne). The Olive Moisturizing Shower Gel contains the plant’s fruit oil, which is famous for its skin-nourishing properties. You can actually see the oil collecting a bit on the top sometimes - just give it a little shake and all is good. I like the fruity scent that has, although it doesn’t linger on my skin after rinsing. The Sweet Pea Fragrant Shower Gel really does smell like a nice bouquet of flowers. It reminds me a lot of the famous Bath and Body Works stuff my classmates and I coveted in the 90’s. It actually contains coco nectar, which has the same benefits of honey but is vegan-friendly. The Glutathione & Papaya Lightening Shower Gel combines both famous ingredients to create a more even skin tone. I’m sure this will be especially useful this summer as sleeveless tops and beach trips increase our skin’s sun exposure. Speaking of sun exposure, I’ve been religious about putting sunscreen on my face but admittedly neglectful of the rest of my body. Body sunscreens often feel heavy and sticky, but Zenutrient’s Papaya Sunscreen SPF50 (P499 for 100ml) is a surprisingly pleasant lotion! It’s lightweight, matte, and quickly absorbed by my skin. It’s even moisturizing enough to swap with your usual body lotion, so you don’t have to apply two separate products. You can also use this for the face as well, but I personally find the herby fragrance too much for my sensitive nose to handle. 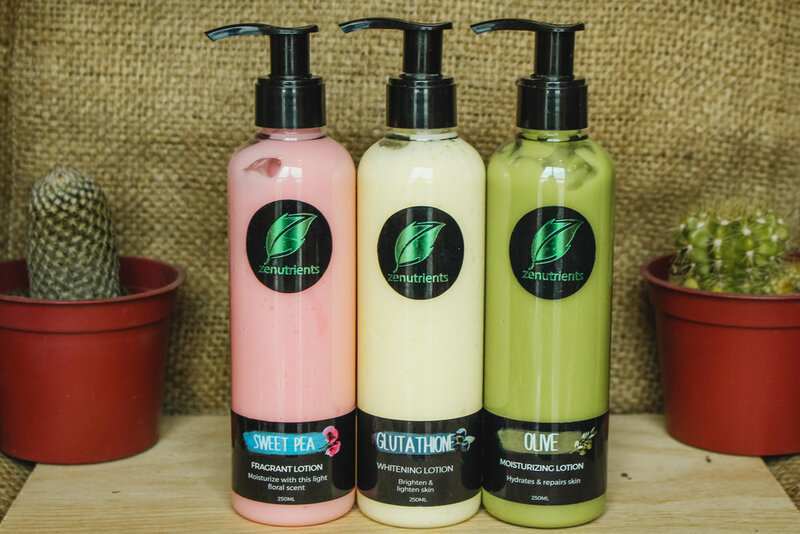 If you do need a heavier dose of moisture, the shower gels have “matching” lotions that nourish your skin with coconut-derived hydrators and keep you smelling good for longer. The bottles are also P248 each for 250ml. Finally, Zenutrients also has skin-caring treats even for the little ones! Their Baby Love line includes a Top to Toe Wash (P325 for 250ml), Baby Oil (P298 for 100ml), and Baby Balm (P248 for 50g). All are formulated with calendula flower extract, which is a popular ingredient for soothing skin while keeping it protected with its natural antiseptic and antifungal properties. It’s also supposed to be a natural mosquito repellant, so that’s definitely an added benefit! Zenutrients has stores all over the Philippines, plus you can find their products in select Watsons, Robinsons, and Waltermart locations. You can also shop them online via their official website, BeautyMNL, Zalora, and Shopee.